In late 1997, Peter Guzli, a man from Budapest, Hungary, was living in the United States. He worked at a hotel in Colorado Springs, Colorado, and in November of that year went to New York City to vacation and to visit relatives. 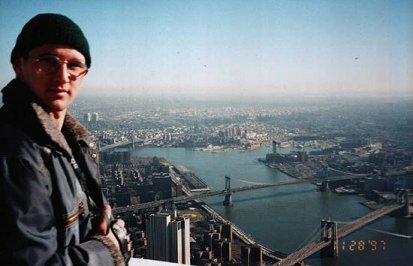 On a chilly 28 November, he went the World Trade Center, still one of the largest buildings on earth. 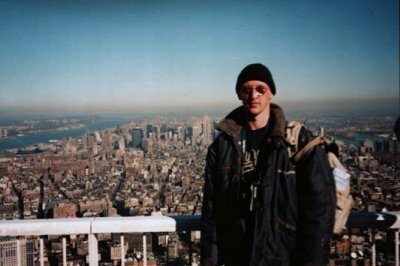 He took the elevator in WTC 2 (south tower) to the 107th floor observation deck, and eventually to the rooftop. He wore a ski coat and stocking cap against the late autumn cold. Like millions of tourists who had made the popular stop since 1974, Guzli took photographs of the miniature Big Apple, and the sight of the north tower. He shot a picture of himself with a Manhattan panorama as a backdrop. Eventually Guzli returned to his homeland, his photographs in tow. They were put away -- until nearly four years later when the structure he visited was destroyed. Guzli remembered his time in the US and his trip to New York. He was flipping through his photos, and one of him standing by the railing caught his eye. Exercising "gallows humor," Guzli pulled the picture into a graphic editing program. He found a picture of a Boeing 757 with American Airlines livery, shot by Jonathan Derden at Dallas-Fort Worth International Airport. Derden's photo was part of a massive database of aircraft photography mainatined by Airliners.net. Through digital manipulation, Guzli placed the jet in the air behind himself, looking for all the world as if it were coming at WTC 2. He added a 09-11-01 date stamp and e-mailed the image to a few friends. We've seen thousands of pictures concerning the attack. However, this one will make you cringe. 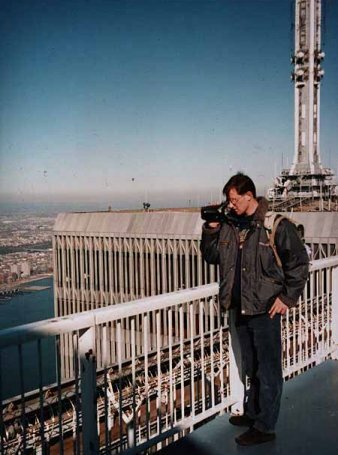 A simple tourist getting himself photographed on the top of the WTC just seconds before the tragedy ... the camera was found in the rubble!! In the heady, fearsome days just following 11 September, the Guzli image became one more urban myth -- but unfortunately some people believed the e-mail and picture. This is one major reason that the bogus tourist photo received such distribution. Another was the skeptics, who simply could not believe that a digital camera could survive the collapse of a 110-story building and tons of steel and concrete. The high in New York City on 11 September was about 72 degrees Fahrenheit, yet the tourist is wearing a heavy coat and hat. The WTC observation deck was in the south tower. It was struck by United Airlines Flight 175. The American Airlines jet, Flight 11, hit the north tower, which had a restaurant at the top (Windows on the World), but no decks. The jet is remarkably clear -- a miracle camera with a high-speed shutter? A real photo would have shown a silvery blur. The jet is a Boeing 757. Flights 11 and 175 were both Boeing 767s. The jet is coming from the north, but Flight 175 had come in from the south. The post-Labor Day hours for the WTC observation deck were 9:30 a.m.-9:30 p.m. Flight 175 hit the south tour at 9:03 a.m. before the deck even opened. The digital date stamp looks phony. After the photo was quickly ruled a fraud, it still found minor fame on the Internet and was taken to bizarre new avenues of humor. The unknown man was dubbed "Tourist Guy" and "Tourist of Death." Other graphic artists of varying skills began to insert him, Forrest Gump or Zelig-style, into other events at history. Therefore, a man born in 1976 saw the RMS Titanic depart for her maiden voyage in April 1912, witnessed the Hindenburg explosion in Lakehurt, New Jersey, in May 1937. He also showed up when the USS Cole was rammed with a suicide boat in Yemen in October 2000. Tourist Guy was then blended with yet another obscure pop culture reference: "All your base are belong to us." This crude phrase came from the introductory screen of a Japanese videogame, Zero Wing, that had been poorly translated into English for US distribution. A villain named Cats appears on the bridge of a rebel starship and declares to the hero that his forces have been defeated. He adds: "All your base are belong to us." This oddball phrase began appearing in digitally altered photos, on billboards, highway signs, storefronts, etc. Tourist Guy was added to the mix when a techno song called, appropriately "All Your Base Are Belong to Us" was added to a Flash movie of Tourist Guy novelty images. There was a commonality of both the Tourist Guy and the phrase "All your base..." popping up incongruously in images. By November 2001, people were asking, "Who is the Tourist Guy?" Initially Jose Roberto Penteado, a 41-year-old businessman from Campinas, Sao Paulo state, Brazil, said he was the man. 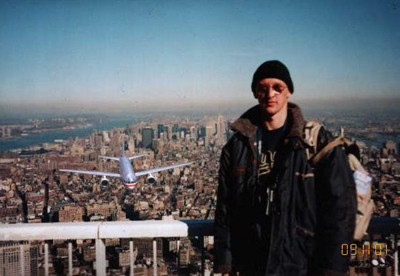 He claimed some of his friends took his head and added to a picture of another person visiting the WTC. Penteado certainly resembled the fellow in the picture. People began to believe him, and Volkswagen's Brazilian subsidiary seriously considered making a TV commercial with him. At the same time, as Penteado was making the rounds, Guzli's friends went to Index, a Hungarian Web news site, wanting the truth about Tourist Guy brought to light. Eventually, the 25-year-old man was tracked down, last name and all, in Budapest. In December, Peter Guzli finally came clean. He went to his parents' house and found the unaltered deck shot, as well as the other two (north tower and holding camera). Guzli e-mailed the photographs shown on this page to Wired News, using only his first name. "I'd like to keep my identity incognito," he said to Wired. "This was a joke meant for my friends, not such a wide audience." Guzli said he did not rush to claim Tourist Guy's identity because he was aware of the mockery that other Web celebs had endured -- for example, accordionist Mahir Cagri, who became known as the "Lovesick Turk" in 1999 after he posted a home page that included an invitation for women to visit him. Guzli's photos were proof enough for Penteado to withdraw his claim and slip quietly back into obscurity. Volkswagen decided against the commercial before Guzli even surfaced, feeling an ad with a guy associated with 11 September was not in the best taste. "Now I believe that the real person showed up," Penteado said in an e-mail to Wired. "I think I have a brother in Hungary, and I didn't know." Tourist Guy Web sites and urban myth repositories carry Guzli's photo to this day. They show how the ludicrous can become maybe too macabre and be taken too seriously.